THE BOILER PLOT is about how the media’s ‘next big thing’ is really a scam that abuses the presumed anonymity of the internet. Alex Sanderson is young, isolated, and hungry for success in a business dominated by men. She’s an American technology PR agent who came all the way to London to work with the best media in the world, when she’s handpicked to hype Avadar, a ‘Google killer,’ in the press. The hype machine is cranking. Alex starts getting in with powerful figures in Westminster. But some things about Avadar don’t add up. It’s creepy—a human-like hologram that lives with you—and its creators are swimming in cash; hardly a typical start-up. Noah Stein, wily, celebrated investigative journalist, starts asking questions: where do they get their funding? Why the Middle Eastern HQ? The world’s economy crashes down on Canary Wharf, and Alex’s relationships crash along with it. But Noah may be a saviour. They travel to Abu Dhabi, risking their safety to learn what’s been lost in the quest for the latest news scoops, and Alex tries to extricate herself from a trap she, in part,has laid. 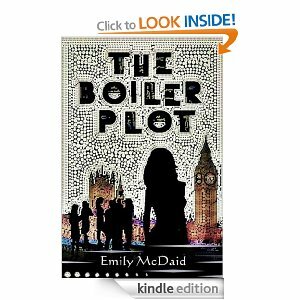 THE BOILER PLOT is a suspense novel about a society weakened by its dependence on the internet, and a media blinded by its hunger for sensation. An assertive female narrator provides an inside view of London’s alluring but cutthroat media technology scene. The Boiler Plot is a white collar crime thriller and begins at a relatively slow pace and doesn’t really pick up until you get 30% into the book. However when it gets going it’s worth the perseverance. McDaid shows she know London very well as well as the world of technology PR. The opening is quite grabbing at set in a court but that’s as close as we get to legal court scenes in the book. I loved the thrilling aspect of this book and have to sa it did grab me but an editor and proof reader could have made it a much better read for me. I’m loathed to give it any less than 4 stars as I did find the premise intriguing the characterisation and scene setting was wonderful. The ending felt like a beginning for me grabbing thrillers? I would not be adverse to reading a sequel featuring Alex, our female protagonist with guts. A refreshing change from guts and gore, this white collar crime thriller is worth a read once you get into it. That looks interesting and more my style without the gore. Thank you for the insightful review.